For many Floridians, their primary residence is one of their biggest investments. With tax day approaching, it’s time to review potential 2018 real estate tax deductions for Florida homeowners. Recent tax reforms have slightly altered what you can deduct on your return for the year 2018 compared to 2017, so make sure to schedule a chat with your CPA or tax accountant if you have any questions. If you bought your Florida home before 2018, you can likely still deduct interest paid on your mortgage for loans up to one million dollars. If you are a new Florida homeowners who purchased in 2018, a cap of $750,000 applies. Vacation homes bought before 2017 can also be considered for this deduction as long as combined mortgages form both homes are under one million dollars. Planning on buying a home in 2019? A larger down payment that keeps your complete home loan under the $750,000 cap means you’ll probably be able to write off all of your mortgage interest next year. Your Florida property tax bill can also typically be written off your taxes if you have proof of payment. Starting with 2018 taxes, the amount you can deduct for property taxes is capped at $10,000. You may also be able to claim a Florida Homestead Exemption to lower the taxable value of your home by up to $50,000. Home improvements made to accommodate a medical condition or disability are often tax deductible, once any added value to the home has been subtracted. This can include renovations to make a home or rental home wheelchair accessible, to renovate a bathroom for a person with a medical issue, to modify fire, smoke, and carbon monoxide alarms for a person with deafness, or to remodel a home for a person with blindness. Renewable Energy Tax Credits also may currently allow you to deduct 30% of the costs of major energy installations, including solar water heaters, solar panels, geothermal heat pumps, small wind turbines, and fuel cells for a home you use as a primary residence. 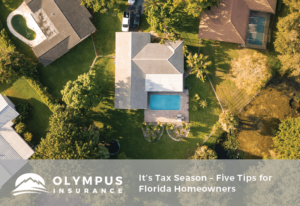 If you own a Florida home which you rent out and carry the appropriate rental insurance on, you can deduct a number of expenses you incur as the owner of a rental property on your income tax return. Deductions may include mortgage interest, property taxes, depreciation on the property, maintenance and repairs, cleaning and yard work and landlord/rental insurance. These deductions and exemptions can lighten your tax burden for the year 2018, and decrease the amount you owe. For more information, visit the IRS website or talk to your tax professional.